Former U.S. President George W. Bush and New Orleans Mayor Mitch Landrieu (L) talk to students at Warren Easton Charter High School one day before the ten year anniversary of Hurricane Katrina in New Orleans, Aug. 28, 2015. Former U.S. president George W. Bush returned Friday to New Orleans - the scene of one of his presidency's larger challenges - to tout the region's recovery from the costliest natural disaster in U.S. history on the 10th anniversary of Hurricane Katrina. Bush visited Warren Easton Charter High School, the same school he visited on the first anniversary of the catastrophic storm. He was accompanied by his wife, Laura, whose library foundation helped rebuild what is the oldest public school in New Orleans. The two met with students at the school's gymnasium, where he was also greeted by New Orleans Mayor Mitch Landrieu and former Louisiana governor Kathleen Blanco, who was in office during Katrina. "It's the same resilience this city has shown the world over the last 10 years. Its best days lie ahead," said Bush, who was president in 2005 when Hurricane Katrina broke through protective levies and flooded the city, killing 1,800 people and destroying 100,000 homes. His administration was roundly criticized in the days following the storm for a slow emergency response to the thousands of people needing shelter, supplies and security amid the flooding. Local officials, especially former New Orleans mayor Ray Nagin and former governor Blanco were also blamed for a bungled response, which changed the political landscape of the state of Louisiana, ushering in Republican Governor Bobby Jindal. On Saturday, former U.S. president Bill Clinton is scheduled to appear at a ceremony marking the anniversary of Katrina's landfall in New Orleans. The ceremony will also feature Mayor Landrieu and local cultural and religious leaders. 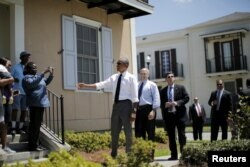 On Thursday, President Barack Obama hailed the southern U.S. city’s revival. U.S. President Barack Obama delivers a speech at the Andrew P. Sanchez Community Center in Lower Ninth Ward of New Orleans, Louisiana, Aug. 27, 2015. 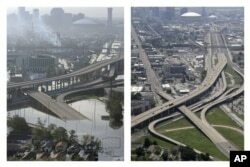 This combination of Aug. 30, 2005, and July 29, 2015, photos shows downtown New Orleans floolded by Hurricane Katrina and the same area a decade later. U.S. President Barack Obama, with New Orleans Mayor Mitch Landrieu at his back, chats with city residents in an area reconstructed after Hurricane Katrina, Aug. 27, 2015.